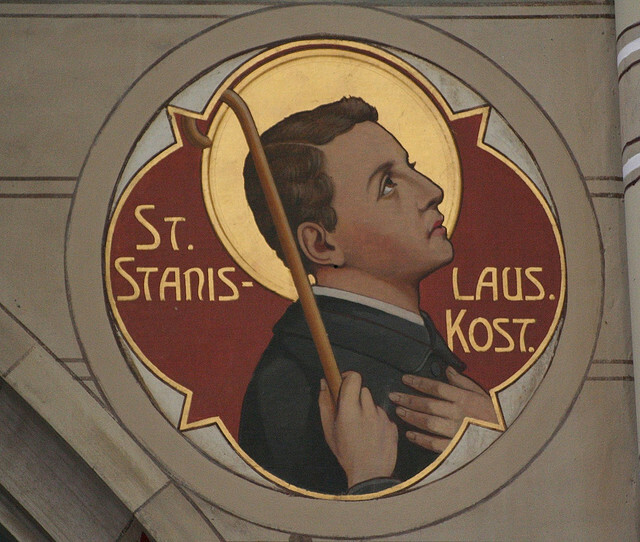 Saint Stanislaus Roman Catholic Church > Who was St. Stanislaus Kostka? The Holy See ratified his beatification in 1605; he was canonized in 1726. St. Stanislaus is a popular saint of Poland and many religious institutions have chosen him as the protector of their novitiates. The representations of him in art are very varied; he is sometimes depicted receiving Holy Communion from the hands of angels; sometimes receiving the Infant Jesus from the hands of the Virgin; or he is shown in the midst of a battle putting to flight the enemies of his country. At times he is depicted near a fountain putting a wet linen cloth on his breast. He is invoked for palpitations of the heart and for dangerous cases of illness (Cahier, “Caractéristiques des Saints”). St. Stanislaus’ feast-day is November 13th.